What Is a Tarte au Sucre? 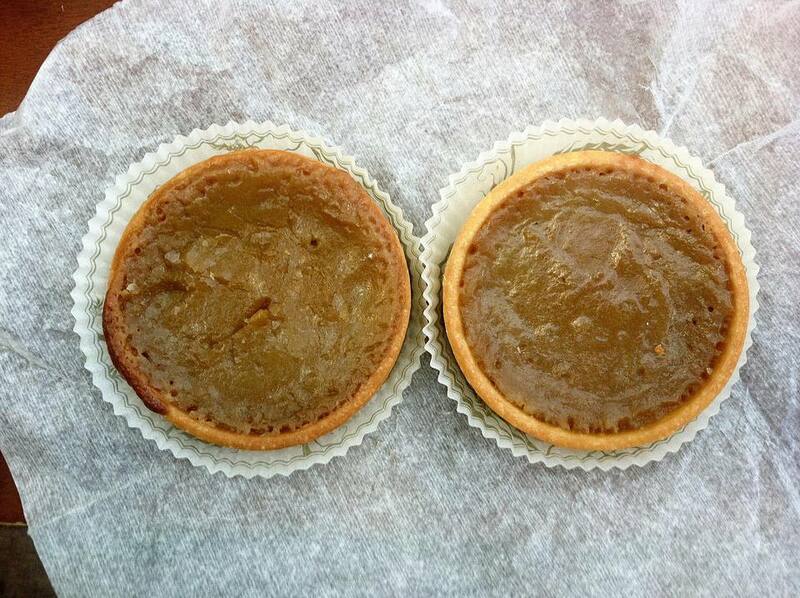 Tartes au sucre, also called sugar pies, are a Quebec or French-Canadian specialty with universal appeal. They are simply a filling of sugar and maple syrup mixed with some cream, plenty of butter, sometimes vanilla and a bit of flour, and a pinch of salt that is baked up in a pie crust. Think pecan pie without the pecans, and you're on the right track. The filling is dense and sweet, but when properly baked it is at once loosely jiggly while also solid enough to slice. When making a tarte au sucre at home, one needs to remove it from the oven while it still seems loose, since the filling will set further as it cools (which is the same as classic pecan pies). Such tarts are common in Northern France (and Belgium), from where so many of the original immigrants to la Nouvelle France, now Quebec hailed. Brittany and Normandy, in particular, were regions of France both famous for the quality of their dairy products and known as sources of immigrants to early Canada. (Anyone who has traveled in both Northern France and Quebec can attest to the similarity of architecture if nothing else!) That they brought this delectable treat with them and started making it with maple syrup should come as no surprise. First, maple syrup was sometimes the only sweetener available or affordable; second, maple syrup adds a unique and tasty flavor to these plain but rich and delicious desserts. The unctuous, sweet filling has made tartes au sucre a holiday favorite in Quebec, and there are many French-Canadian families whose holiday table would be far from complete without one of these beauties sliced up at the end of the feast. A simple topping of whipped cream is all the adornment a tarte au sucre requires. "Sugar pies" are well known in Maine and other parts of New England, even areas without clear French-Canadian connections. The simple sugar-butter-cream combination is difficult to pin down as having a single origin. Other North American immigrants brought similar concoctions with them. In particular, Shoofly Pie, a specialty of the Pennsylvania Dutch (also known as Amish), is a well-known dessert with similar ingredients. Indiana is home to desserts called sugar cream pies, which have more cream and flour in them, creating a paler, fluffier filling. In some parts of the U.S. similar pies are known as "finger pies," a name that comes from the need to stir the filling as it bakes without breaking the pie crust and the resulting practice of stirring the filling in the pie crust with a finger as it bakes.